The world is in conflict and chaos. Racial tensions are soaring in American cities and our government appears poised to lock down America with Jade Helm. Bad News. The good news is that HaShem (literally “The Name”), the epithet Jews use for God, is working in the world to bring about redemption for his people. In the last 20 years or so, the Spirit of Holiness has open up the hearts and minds of numerous people and people groups. In the Last generation we have seen the restoration of the nation of Israel and millions of scattered tribes of Israel return to their ancient homeland. Jews from the House of Judah and various persons and groups from both the House of Judah and the House of Israel have been awakened in these Last Days to who they are. It has happen to many people I know including my own family. God is working in the world amid the death, destruction and evil that is all to commonplace. The following article is from Aish.com regarding the Jews of Montana. Posted in God' blessing, Signs of the times, The Hand of God, The Jewish People, The Redemption. A steady stream of Jewish people have returned to their ancestral homeland since the beginning of the 20th century. But more still need to return. The times we are living in a the days of Prophecy for the fulfillment of the Redemption of Israel and those who battle along side her.But these days begin in darkness with evil trying to overcome light and hope. Following the shooting dead of a Danish Jew outside a Copenhagen synagogue on Sunday, the Israeli Prime Minister, Benjamin Netanyahu, has urged European Jews to immigrate to Israel. Netanyahu announced the government will discuss Sunday a $46 million plan to encourage Jewish migration from Belgium, France and Ukraine and said at the start of a cabinet meeting that Israel is the home of all Jews. “Extremist Islamic terrorism has struck Europe again… Jews have been murdered again on European soil only because they were Jews,”…”Israel is your home. We are preparing and calling for the absorption of mass immigration from Europe,” and Jews wherever they may be: ‘Israel is the home of every Jew… Israel awaits you with open arms,” he said. “Europe is waking up to a new era, a new reality, to which we in Israel and around the Jewish world have been pointing out for the last 10 years. We are witnessing a rise of anti-Semitic attacks and expressions,” expert on anti-Semitism from the World Zionist organization Eitan Uri Bakhar told RT. At the annual Taglit-Birthright ‘Mega Event’ in Israel, Netanyahu asked thousands of participants to hold a minute of silence for the victims of the attacks at the offices of satirical magazine Charlie Hebdo, in which 12 people were killed, and later at a kosher supermarket in the French capital in which four Jewish men were murdered, among them Yoav Hattab. The young Tunisian Jew had visited Israel with Birthright, the program that brings Jewish 18-to-26-year-olds on free 10-day trips, just a few short weeks ago. “Tonight, I call on all of you, and on all young Jews around the world: Come to Israel, Make aliya. This is your country. This is your birthright,” the prime minister urged. One of the 10 Lost Tribes of Israel, the members of Bnei Menashe have waited 2,700 years to visit the Western Wall for the first time. Recently arrived from India, seeing them come before the Western Wall is watching Biblical prophecy being fulfilled! In December 2013, under the auspices of the Israel Returns organization, the Israeli launched Operation Menashe. The project opened the gates of aliyah to the Jewish Indian tribe of Bnei Menashe and has allowed them to return home to Israel. The Bnei Menashe are the descendants of the tribe of Manasseh, one of the Ten Lost Tribes of Israel exiled by the Assyrian empire in 722 BCE, toward the end of the First Temple era. Over the last two years, more than 3,000 Bnei Menashe now call Israel home. “Their God changes the path of our rockets in mid-air, said a terrorist,” was the headline in the July 18 edition of the Jewish Telegraph. Posted in Eretz Israel, Hamas, Israeli Security, Signs of the times, The Hand of God. King Nebudchadnezzar’s statue, revealed to Daniel in a dream is the very first revelation of the entire span of human history and government. Rabbi Moshe Alshich, (1508-1600) student of Rabbi Yosef Caro and immanent teacher of Rabbi Chaim Vital, taught that the 60 cubit statute that Nebudchadnezzar made refers to the primary epochs of human history, ending with the Kingdom of HaShem. He said that in Nebuchadnezzars dream, the history of man was divided into four periods, each represented by a section of the image, being composed of different material. And because the fourth kingdom was composed of two substances, iron and earthenware (clay), it represented a total of five kingdoms, which would be followed by a sixth kingdom – the government of HaShem. The rest of this section can be located at our Daniel – the Visionary of Israel page. A passage from Megillah 3a tells us that within the Ketuvim (writings) the Kietz or End is contained, meaning the time when the Messiah was to come who would lead Israel to it’s final redemtion. 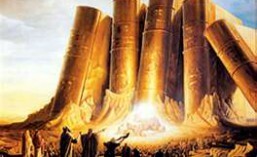 The Book of Daniel is part of that biblical collection. The closing chapters of Daniel contain the visions of the ‘Kietz’, but Daniel was instructed by the angel Gabriel to conceal them from human understanding. Jewish tradition tells us that Yonathan ben Uziel, most brilliant of Hillels disciples, revealed the mysteries of the prophets in what we know as the Targums, but when he desired to reveal the secrets of the Writings, a heavenly voiced forbid it, because the secret of the End is contained there. In these cases, these Jewish communities were in dire need of hope and encouragement and the study of the End was particularly uplifing because it foretold of the demise of Israel’s enemies and the re-establishment of the Davidic Kingdom. In fact one of the prominent features of the Apocalyptic genre, of which the Book of Daniel is archetypical, was to give comfort to a persecuted people. Daniels visions are part of the apocalyptic tradition and in reality its foundational document. During his days, the Jewish people needed encouragement that God had not abandoned them and that he was working on thier behalf to bring about thier redemption.